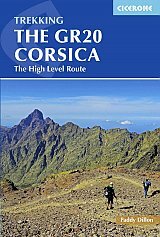 This guidebook describes the classic GR20 trek, the north to south traverse of the rugged mountains of Corsica. Starting in Corscia's north-west, in picturesque Calenzana, the route winds south-east, through the heart of Corsica, finishing on the eastern side of the island, just north of Porto Vecchio in the township of Conca. Described in 16 stages with high level/low level alternatives for relevant stages, the route is roughly 200km in length and takes approximately two weeks to complete. The GR20 climbs high into the mountains. It is demanding trek and only suitable for experienced walkers. Step-by-step descriptions of each stage are accompanied by 1:50,000 mapping, together with information on ascent/descent, terrain, and food, water and shelter en route. Also included is invaluable information such as path conditions, what to take, and getting to/from and around Corsica. This comprehensive guide also includes information on the history and geology of Corsica, together with notes on the local plants and wildlife. An island of surreal beauty, Corsica showcases dramatic mountains, enchanting coastline and ethereal vistas. Bare rock and sheer cliff contrasts with black sand beaches, alpine pastures and pockets of forest. Mediterranean flair abounds, history lingers and culture is celebrated, making it the perfect destination for a trek bursting with adventure.